The material of the fireproof board surface has been widely used in high-end fast food restaurants. The fast dining table and chair on the fireproof board has the characteristics of large color selectivity, strong fire resistance and high temperature resistance, high color stability and high wear resistance of the surface, which is favored by the purchasing staff of the restaurant. In the material of the fast dining table, the surface of the melamine has the lowest quality and the surface is easily faded, broken and corroded. However, due to its low material cost and ease of manufacturing, low-end product manufacturers often use melamine board as raw material, and even more, use melamine board as a fireproof board. Careful identification is also required at the time of purchase. The tempered glass-steel tabletop is gradually emerging. This type of tabletop is easy to clean and the bottom surface can be sprayed. It is popular among some high-end restaurants. Pay attention to the production of the glass edge when selecting, it should be as smooth as possible, no sharp corners. In the fast food restaurant, the common dining chair for the fast dining table and chair is a curved wooden chair, a fiberglass chair and a steel wood chair. The curved wood chair is durable, has a variety of shapes, and is simple and elegant. It has become the first choice for fast food restaurants. FRP chairs are currently only used in school canteens and public places, and are not recommended for fast food restaurants. The steel wood chair has a low material and should be selected when selecting. The structure of fast food tables and chairs is roughly divided into two types: a joint structure and a split structure. The connected structure is easy to place, but it is not easy to move, and the comfort is not reached. The fast-food restaurant tables and chairs with slightly higher grades no longer use the connected structure. The split architecture is easy to mess, customers need to re-regulate after the move, increase the workload of the waiter, but the split architecture is easy to move and recombine, and the comfort is higher, which is also the first choice for fast food restaurants. When choosing the architecture material, pay more attention to the design rationality of the architecture and its stability. If it is a steel frame structure, it is necessary to pay attention to the wall thickness of the steel frame. The first type of fast food restaurant table and chair placement: lobby-style fast food restaurant lobby-style fast food restaurant is mostly a large factory or school restaurant. The tables and chairs are required to be neatly arranged, so it is best to use a fast dining table and chair connected by tables and chairs. The relative fixation of the tables and chairs makes the atmosphere of the restaurant look orderly and not messy. If there is extra space, or if the restaurant has a snack department and other institutions, you can put a corresponding round table or square table, single chair, convenient for the diners to gather together or dine alone, to create a warm dining environment for the restaurant. The second type of fast food restaurant table and chair placement scheme: multi-storey fast food restaurant or canteen multi-storey fast food restaurant refers to restaurants or factories that distinguish different dining styles, such as snacks on the first floor, fast food on the second floor, three Order the meal. Such fast food restaurants are generally smaller than lobby-style restaurants, but are slightly more spacious than smaller private restaurants. This way you can choose a faster dinette with a slightly larger size. The diversification of the dining room makes the dining table and chair more effective, and the color of the dining table and chair can be more abundant, which promotes the appetite of the diners. The third type of fast food restaurant table and chair placement scheme: the relatively small area of the fast food restaurant is relatively small, the fast food restaurant preferably uses a light and movable fast dining table and chair. The limitations of space, the movement of tables and chairs provides more space available. The square table is placed side by side, neat and beautiful, a square table can accommodate 8 guests, plus a movable fast food chair can be increased to 10 people. 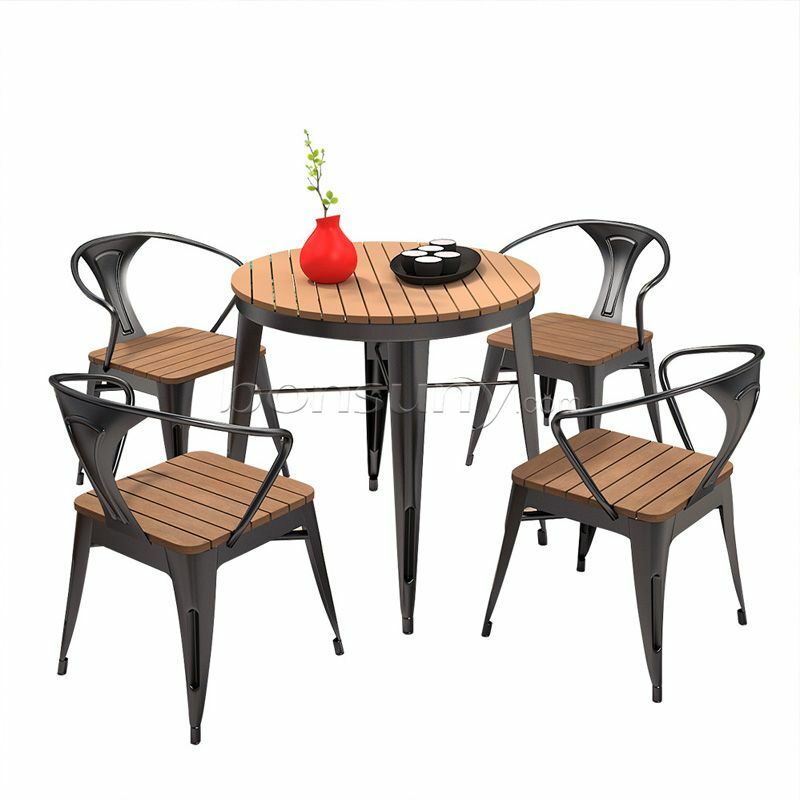 Put the round table in the middle, suitable for three or five friends to eat together, if necessary, you can increase to 7-8 people. This greatly increases the space available. Next：How much is a Sydney leisure and comfortable single chair?